In response to Guests who have provided the feedback of not wanting to leave the B&B, our plan is to offer “Foodie Weekends”, packaging dinner in as much as possible. Hosting these efforts is Chef Rebecca Hassell, who has partnered with us on special events since April 2017. She comes to us from DC during these special times, and unlike the Floyds – is professionally trained in the art of cuisine. 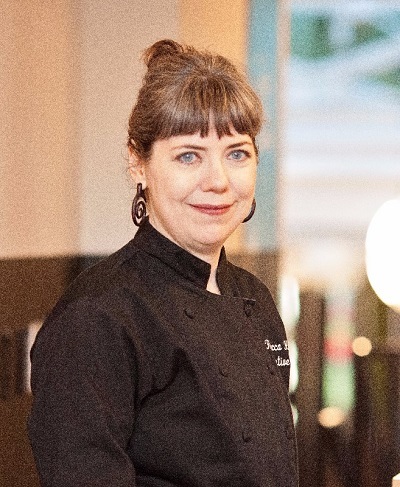 She has experience at the top restaurants in DC including the Equinox, Tabard Inn & Masa 14. She serves a Japanese fusion menu and has developed quite a repertoire in her time with us thus far. Pictures and menus of her style can be found on our facebook page. The two night packages are $650 or $750 depending on the room booked. This includes dinner and breakfast for up to two Guests for both days. We typically offer several courses on the first night and five on the second night. As per usual, Guests have the option of having an American or a Japanese breakfast in the morning. PLEASE NOTE: Apologies, the old fashioned art of speaking on the phone for these packages is required. FOODIE – GROUPIE WEEKENDS! Book an exclusively yours weekend with Friends, Family or perhaps a Work Retreat! Rates based on 2 Guests are $730 for the Pine, Cedar and Maple rooms or $830 for the Oak or Sunrise room. Meals include dinner both nights, breakfast both mornings and Saturday lunch bentos!